Lea with her design for the Oakland Public Library. I want to introduce you all to our newest team member at Resurrect: Lea Zalinskis! Lea has worked at Resurrect for three months now and we are so happy to have her on board! Lea herself is an artist and we currently have some of her incredible prints in the shop for sale. She will also be one of our featured artists for our holiday art show. Read on to learn more about Lea's favorite spots around Oakland and her latest artistic adventures! How long have you lived in the Bay Area and what do you like about living here? I’ve lived in the Bay Area my whole life-- was born in San Francisco and grew up in West Berkeley before going to college at CCA in Oakland. After another stint in Berkeley, I’ve recently returned to Oakland, and I couldn’t be happier. There have been a few times where I was bent on getting out of here, especially after traveling, but it’s very hard to make a good argument for leaving. We have the best weather, stunningly beautiful nature, & the best food. Above all, the people here have a certain spirit that I’ve always felt proud of. What do you like doing in your spare time? What are your favorite spots around Oakland? I have a preoccupation with food, so if I’m not eating I’m thinking about what I’m going to eat, cooking, baking, or making drinks. For the past couple of years I’ve been experimenting with cocktails. It gets more fun as I get a better feel for combining ingredients… and I feel less bad about testing my inventions on friends. My absolute favorite place in Oakland is Mountain View Cemetery. Whenever I feel stuck or frustrated or bummed out, I walk to this certain spot at the top of the hill, turn around, and take in the view of the whole bay. You can see the whole sky and everything cracks wide open. It almost always cures what ails me. What inspires your personal style and what are you looking to add to your wardrobe? I grew up in the East Bay punk scene, and as a teenager I made earnest/hilarious attempts to emulate the guys in the bands I liked. I probably wore the same black cutoff pants, tons of black eyeliner and a band shirt for like, 360 days out of each year. My hair was always some crazy color. I refused to wear anything “girly”. The androgynous look with a goth/punk flavor is still really fun to me. Now that I’m older I feel like I can give a nod to that in a way that feels more adult-- a customer who came in the other day joked about being a former goth, and we agreed that “former goth” should be an actual style category. That mixed with a 1920s vibe would be a fun style goal. Working at Resurrect has made it very fun to make wardrobe updates. I recently bought the Nooworks cheetah print muscle tee and realized it goes perfectly with my black and white polka dot cardigan. Now I’m excited about the idea of mixing prints. I’ve also finally realized that crop tops are amazing, and will probably be looking for all kinds of high-waisted bottoms to go with. Whatever I do with my wardrobe, my one rule is to only wear things that make me feel like myself. And if I get dressed to go out and something doesn’t feel quite right, adding a badass leather jacket is always the answer. You are a paper illustrator and animator. Tell us more about your other job and how you came to love creating images with paper. I love the feeling and the sound of cutting paper. Working with my hands to create something tangible has always been extremely satisfying. I’m a freak about details, and cutouts lend themselves very well to sharp details and clean lines. You get a lovely graphic quality but your hand still shows in the work. The other advantage is indulging my crazy Virgo side by cutting tons of miniscule shapes and gluing them on with tweezers. Right now my focus is making cutout illustrations for print-- both for clients and for my own series of cards and prints. In March, I was lucky enough to have my Night Heron design selected for one of the new Oakland Public Library cards. My other favorite project so far has been designing a bag for Rhetoric Coffee-- they’re a great roaster in Berkeley that features new hand screen printed art on their bags for each roast they do. What are your upcoming projects you are working on? I’m stoked to be doing another bag design for Rhetoric Coffee soon. The really exciting thing after that will be creating a body of work for a holiday art show at Resurrect. It will be my first time showing paper cutouts in a physical space, and the largest series of cutouts I’ll have done to date. This is an opportunity to go totally wild. The title of the show is “Underlings”-- all the pieces will center around animals that get a bad rap. Joining me will be Oakland artists Matthew Leibowitz and Ian Oliver-Wheeler. They’re both tattooers (Ian owns Apex Tattoo just upstairs from Resurrect) and both do beautiful work in ink and watercolor. I cannot wait to see all of our work together! We are thrilled to begin our blog by featuring one of our favorite makers that has been at the shop since the day we opened: Mastrich Metals! 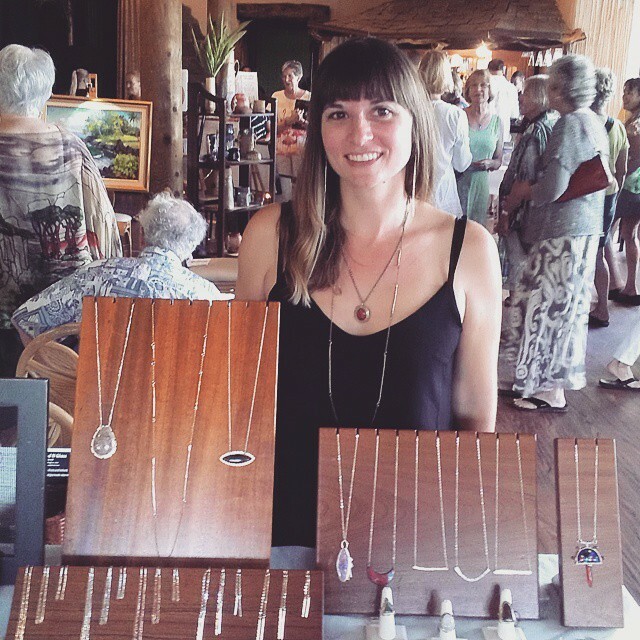 Mastrich Metals is created by Devon Steck in her home studio in Maui, HI where she has lived since 2006. Devon personally designs and fabricates each piece of her jewelry line by hand. Her modern designs incorporate enameled copper, sterling silver fabrication, unique stone cabachons and the use of mixed metals. Her one of a kind jewelry has a modern edginess that really stands out, but is also easy to mix into your mix of daily accessories. Devon has been and continues to be a huge part of Resurrect's success. She and her husband even came out to help with some construction and store preparation during the week of Resurrect's grand opening! Stay tuned for future trunk shows with Mastrich Metals in 2016! To see Devon's newest creations and artistic process follow @mastrichmetalsjewelry on Instagram. Devon (left) and Kate owner of Resurrect (right) at Resurrect's 1 year anniversary party wearing all Mastrich Metals creations!